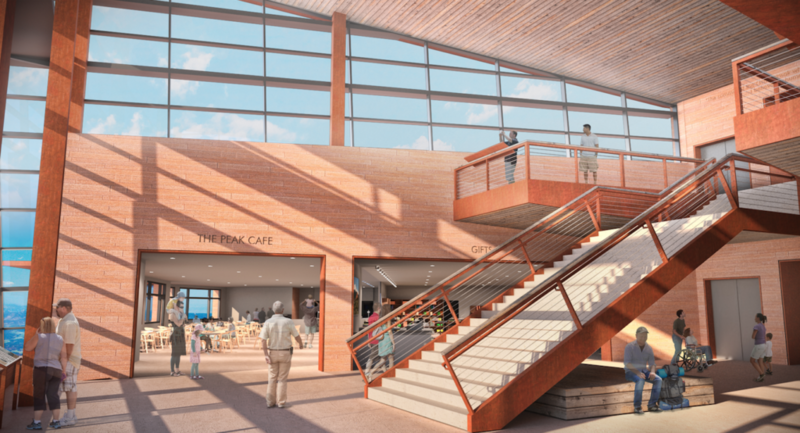 The Pikes Peak Summit Complex is truly a once-in-a-lifetime project. Located 14,115 feet above sea level, the access to the summit via foot, car or rail is what has helped define Pikes Peak as “America’s Mountain.” The mountain annually hosts more than 600,000 visitors. 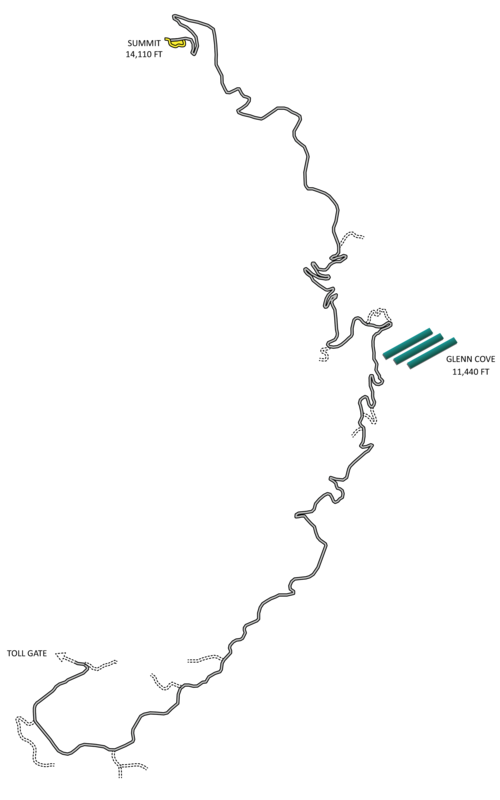 BranchPattern is working with a unique stakeholder group comprised of the U.S. Forest Service, Army Corps of Engineers, City of Colorado Springs, Pikes Peak Cog Railway and Pikes Peak America’s Mountain. Under this arrangement, the design team is developing the concepts and plans for a new, ecologically sensitive Visitors Center and Army High Altitude Research Lab (HARL). With goals of Net Zero energy and Net Zero water use, our team helped inform architectural concepts, materials and systems to minimize energy use. Because of the project location, it’s subjected to harsh weather conditions resembling few other places on Earth. 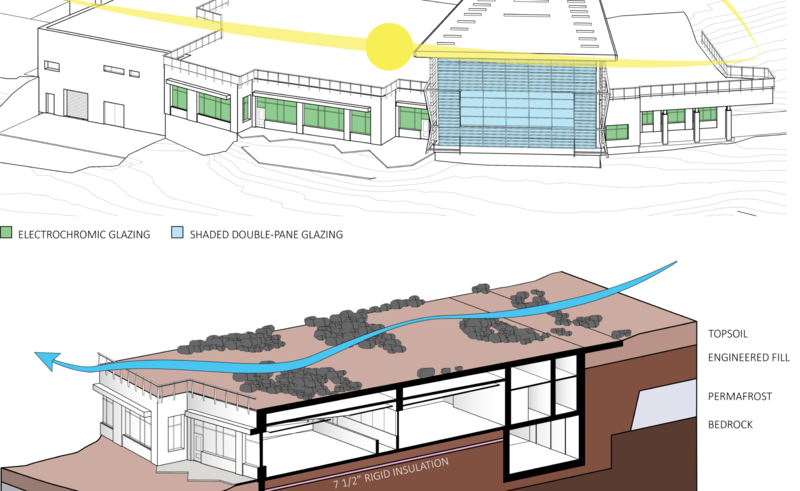 Approximately two-thirds of all hours annually are below freezing, thus the proposed building is heavily insulated and has a very low window-to-wall ratio. Roofs are designed to achieve R-90 and walls are R-40 precast concrete insulated sandwich panels. The north side of the building is sunken into the summit, using the earth to further insulate the building while allowing visitors to walk atop its roof without impeding views from the top of the mountain. Sinking the building also helps to mitigate damage to the structure from high winds, which at this altitude can exceed 150 MPH. South facing, high-performance windows are installed in the lobby space to allow for passive direct solar heating. Electrochromic glazing is used in other south facing spaces for glare protection. To achieve Net Positive energy, the dramatic energy reduction strategies are coupled with a photovoltaic (PV) array to generate renewable energy. The proposed location is at a lower altitude, at Glen Cove which is approximately 4,000 ft below the summit. At this location, the PV will be better protected from harsh wind conditions which would cause damage. 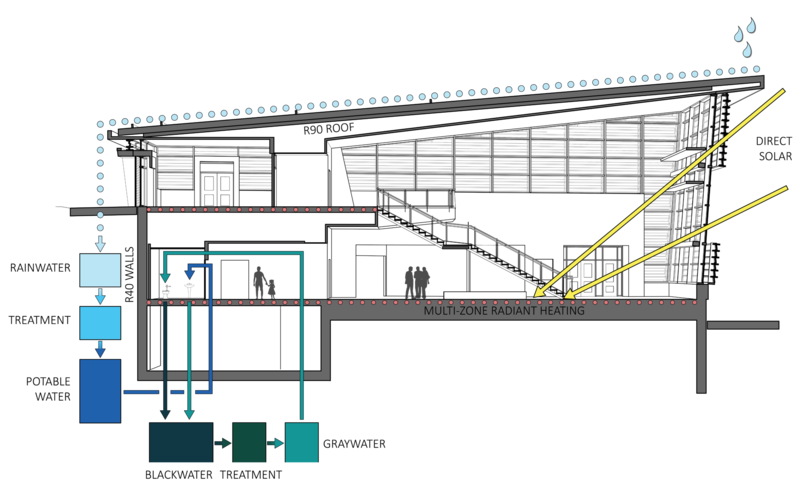 The building systems provide heating through multi-zoned floor radiant heating and Energy Recovery Ventilation (ERV) for fresh air. Fresh water is not available on the summit without being trucked 40 miles round trip, so the project has proposed rainwater and blackwater collection, treatment, and reuse. Rainwater would supplement municipal water for potable needs. While graywater and blackwater would be treated onsite and reused for toilet flushing.